This was a HIT! A hit, I tell you. I used it as a part of my poetry unit in my second grade classroom. One of the things I do is set up a poetry scavenger hunt. I check out 50 poetry books from my local library and 25 more from my school. I have all the books all over the room and do book talks all week long. The kids have an assignment to read lots and lots and LOTS of poems as they hunt for particular things. They look for things like a poem that doesn't rhyme, a poem about a holiday, a poem that is funny, a poem that is sad. The things second graders look for are far easier than the hunt I sent my 4th graders on. Then, at the end of every day, we all pile up on the reading rug and kids can read aloud the poems they found and loved that day. It's a marvelous way to teach children a love of poetry. Plus, they learn that readers share and talk about what they are reading. I think by the end of our poetry unit every poem in this book had been read aloud. 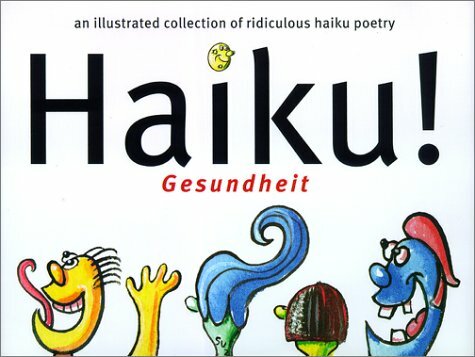 This is a great little book for teaching Haiku poetry. I teach ESOL and have a kid who is just learning English. He needed funny pictures and few words and has enough sophistication to get some of these jokes. A charming, disarming book! Cute, silly haikus, but would have liked to see a bit more in a book.